Big surfboards with plenty of buoyancy and size to help the novice surfer learn to surf! 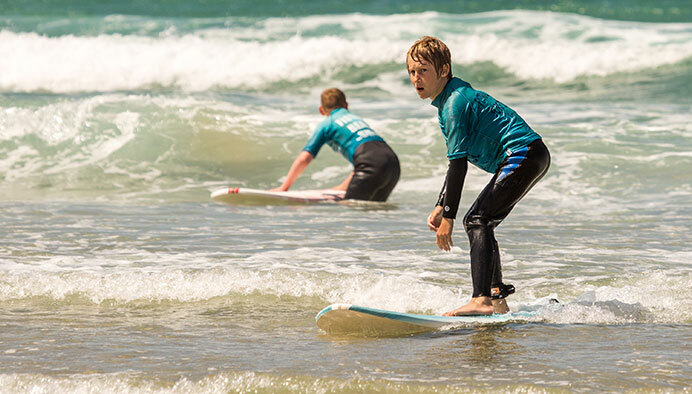 Foamie’s are fantastic boards, the perfect boards for learning the foundations of surfing. Foam boards are very buoyant, with lots of volume and a soft construction. All of this lends them to be much more forgiving than other surfboards, and pick up the waves earlier. They are called “foamies” because of their soft foam construction. enabling the beginner to catch waves easily. We have a large selection of foam surfboards; from those suitable for the youngest grommet surfers, to Tonga’s 2015 World Cup Squad. As with any sport, when you begin surfing you want the surfboard to be as forgiving as possible to allow lots of progression. A foam board is the most stable type of surfboard, making them easier to learn to catch waves and stand-up on. Alongside surf conditions, the size of the surfboard you start surfing on should be relevant to your own height, weight and fitness.